Miles beneath the layer of ice that covered Earth in the New Ice Age of 2300 A.D., men survive in the subterranean cities they built to save themselves as the ice crept with killing cold over all living things. For three hundred years no one has seen the surface or communicated with any other city. Until now. Now the few scientific instruments that remain seem to indicate that the Ice Age may be ending; outside temperatures are reaching a level that may make life possible―though not easy―on the outside. But life in the underground cities is comfortable, and those few who are brave enough to be curious about the unknown frozen world above are suspect; troublemakers. A small party of these “troublemakers,” led by Dr. Raymond Barnes, with a few scientists and others who think they might prefer freedom to safety, has been allowed to take the long-unused elevator up through the ice to the outside. But they go more as exiles than as a scientific expedition; they are not expected―and may not be allowed―to return. I picked this week’s book for a single reason: it’s too damn hot outside. The truth is that two weeks ago I reviewed Cryogenic Nightmare. Last week it was The Long Winter. I didn’t intend to follow a theme at that point; it was just a nifty coincidence. I noticed it, though, and scanned my to-read shelves to see if there were any other books about cold stuff. Sure enough, the stack of books Joachim sent me last year had this one in it, and I was quickly decided. I’m not one to hem and haw over which book I’ll do in a given week. With some exceptions, I usually grab one and run with it. That said, this was one of the quickest decisions I’ve ever made. 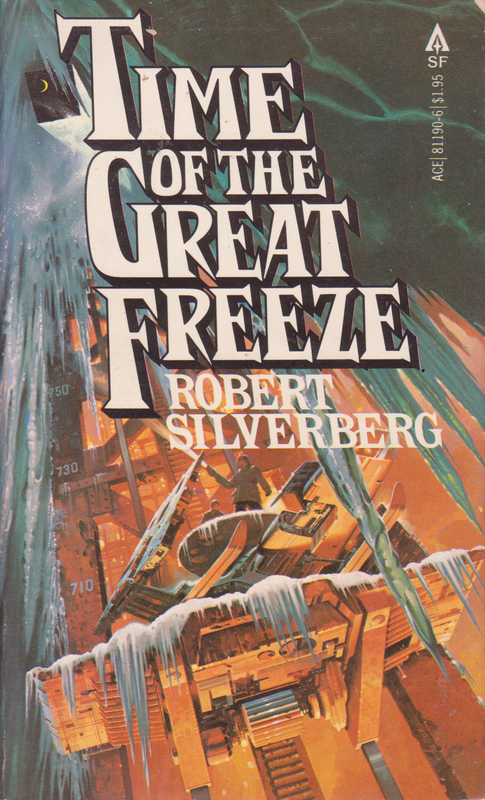 I’d never read Silverberg before, so I wasn’t sure what to expect. I knew of him. He makes a lot of lists. He’s won Nebulas (Nebulae?) and Locuses (Loci?) and Hugos (Hugoj?) and I’m sure there are others. Wikipedia says he’s attended every Hugo ceremony since 1953. He also just sort of looks like somebody I’d like to hang around with. I guess it’s time to actually discuss this novel. Sadly, there’s not a huge amount to talk about. It’s not that it was bad, or even meh, it was a nice, tight narrative and it had plenty going for it. It was also what we’d call now a YA novel, which is fine. I’m all about the YA. It’s just that this was also a very straightforward novel, without a lot of elements that bear talking about at any great length. No big lessons here, no grand ideas. That’s fine too. I’m just not all that sure what to say at the moment. I’m sure plenty will come to me. The book takes place in the 27th century. Earth is finally emerging from a three-hundred-year ice age that caused humanity to flee either underground or to the equatorial zones. Our hero, seventeen-year-old Jim Barnes, is a descendant of some of the people who went underground. He’s from New York City, a vast complex located nearly a mile beneath the glaciers that cover what were once the temperate latitudes. Life there is good. The population is strictly held at around 800,000, everyone is provided for, and crime is nearly nonexistent. Jim’s part of a group that yearns to explore beyond the underground city. His father, Dr. Raymond Barnes, is a member of that group. Dr. Barnes is a historian. Scientists have discovered that the temperature above is beginning to rise a little bit. A degree a year or so. Pretty soon, the glaciers will begin melting and the outside will be survivable again. In standard fashion, though, the status quo must be preserved. Everyone is safe in the underground city, and even considering leaving is an act of treason, or heresy, or something along those lines. So when Jim and his dad and his friends get caught with a radio trying to communicate with another city, specifically London, they get arrested. And that’s what they do. Fortunately, they aren’t just thrown out naked. They’re given equipment to help them in their mission, which they decide is to go visit London. I think the party consists of eight people. Maybe ten? I don’t exactly remember. Most of them weren’t especially notable characters. A few of them die on the way to London, and while it was supposed to be sad, the characters weren’t really fleshed out so much that I felt all that bad about it. Since there was very little discussion of race in the book it’s hard for me to know if I was supposed to imagine all of the characters as white or if I’m free to just assume they were as multicultural as a group of New Yorkers ought to be. One exception to this is Ted Callison, who is explicitly stated to have a Native American heritage. Some of the other guys tease him about it in ways that in ’64 were just light-hearted funnin’ but today came across as really insensitive. One thing I noticed that is neutral in terms of quality but interesting in terms of writing is how the chapters of this book each had their own little separate story arcs. They formed a complete narrative, but each chapter was a complete problem-resolution-denouement arc that flowed from the previous one and into the next one. This is something I see rarely in any books, at least as strongly as this one. None of the chapters ended on a cliffhanger or a big twist. They are all tiny little narratives. My suspicion is that this stems from the YA nature of the novel. It seemed like a very middle school “this is how a book works” kind of lesson, which was great. I’d recommend the book to any middle schooler who wants to read an adventure story. The whole story is basically a sequence of smaller adventures. First the group meets some savages that don’t speak any language at all and hunt with spears and wear skins. There’s tension but it’s resolved. Then there’s wolves and they get fought off. Then there’s some mean people who speak kinda funny and medieval-ish. One of the party dies from acute spearing. They get to the (frozen) Atlantic Ocean and set across. Near the middle they meet some friendly people who agree to help them out. It turns out that the entire ocean isn’t frozen over, so the group will need a way across the water bit. There are seafarers but they’re generally nasty folk. That being their only option, the party heads out that way. The ice gets more dangerous as they go there, so a member of the friendly tribesmen helps them get there safely. One of the party falls through the ice and dies. This is one of the more emotional deaths, since it’s completely out of the blue and surprising. Jim, who is about to come into his own as a character who does stuff, is distraught. He can’t bear the thought that someone was just walking next to him and is now gone forever. They find the water and meet some folks that are basically vikings. The captain agrees to carry them across if one of them takes him on in single combat. Jim steps up to the plate. We learned earlier that Jim is trained in judo, which the book treats as sooooo exotic (which it probably was in 1964, but it’s funny now). Jim uses his judo moves to take down the captain without hurting him too badly, although when the captain flies into a rage, Jim has no alternative than to dislocate his shoulder. This earns the captain’s respect, and he agrees to take the party across the ocean on the grounds that Jim teach him some judo moves. Around this point in the book I noticed there weren’t all that many pages left, but it seemed like there was a lot of story that needed to be told. It turns out that the ending isn’t the strongest part of the novel. Using their radio, the party is able to tell London that they’re incoming. London sends out a party to meet them. They do, but then it turns out that the Londoners are just as paranoid and complacent as the New Yorkers, and the party turns out to be sent to kill them. The crisis is averted, not through violence but through the fact that Jim is a good guy who does a good deed and convinces the Londoners that everything’s okay. Around that same time, everybody sees something weird: an airplane. It flies over and circles a bit before leaving. Nobody knows what’s going on. The joined parties unite and head toward London, but then there’s a snowstorm and Jim’s group gets separated. They begin to run out of food and it gets colder and colder, when eventually everything goes black. I’m not a fan of the “Everything goes black and the characters wake up somewhere else” style of storytelling. In all fairness, I’m guilty of it myself. I’ve railroaded countless D&D parties with something like “The wizard shows up and there’s a bright white light and you all wake up in the forest instead of wherever you just were.” Not my finest moments as a DM, but we live and we learn. I feel like Silverberg chose to do it in this case because he realized he was coming up on a contracted word count and needed to finish the story off, even though he had more to say. After all, there were several mentions throughout the story of the equatorial latitudes that didn’t have to go underground. What happened to them? Have they been advancing in culture and technology this whole time? Or did the cold finally get to them, too? It turns out that the correct answer is the first one. The airplane everybody saw was from Rio, and after Jim and pals passed out, the plane picked them up and took them there. There’s some discussion about how it’s time to use their technology for good and now Jim and crew can help with that. Oh, and everyone is okay except for the people who died earlier, so happy ending I guess. It’s not the best ending, but I still like the rest of the book. Probably the best thing about the whole thing is Jim’s sense of wonder about the world around him. He knows very little about the world above New York City, and everything is new and exciting. He’s not dumb―there’s plenty he knows intellectually from reading history and such―but the experience of it is special. Take, for instance, his first sight of the moon. It’s overwhelming. It’s painfully bright. Later, he sees the sun rise for the first time. The book’s full of little bits like that and that’s what I liked about it. It’s not got much to go on in terms of plot, or characters, or message, but it does have a lot of decent little bits that make it all worth it. Like The World Inside, The Man in the Maze, Dying Inside, Downward to the Earth — absolutely one of my favorites. If I remember correctly, I sent this one to you as it was Silverberg at his most interchangeable, it wasn’t stamped with his vision, and felt like something cranked out in a month with little effort. Yeah, Silverberg’s kind of weird. He was always able to write top-notch stuff, but there was also this period where he wrote like four novels a day. Most of them have a couple of interesting bits and then a race to put in enough words for the sale. It’s hard to think of another author whose wordcount-times-quality number is so constant. But there is something comfortable and easy about books from the era when he was writing them faster than it takes to read them.